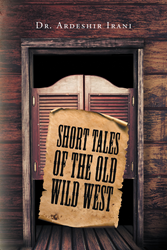 Recent release “Short Tales of the Old Wild West” from Page Publishing author Dr. Ardeshir Irani is an engrossing book about the various people who have been in the territory of the Old Wild West, from the good and courageous to the bad and the cowardly ones. Dr. Ardeshir Irani, a former researcher and professor who currently spends time trading stocks and options online and playing poker, has completed his new book “Short Tales of the Old Wild West”: a fascinating short story collection on the gang in the Old Wild West, composed of gunslingers, lawmen, kidnappers, Indians, renegades, bounty hunters, and outlaws. Published by New York City-based Page Publishing, Dr. Ardeshir Irani’s delightful book is a creative mix of both historical facts and fiction; this is his effective way of making the stories inside more interesting. This is also his second book of unfolding short stories of the people in the Old Wild West. Readers who wish to experience this appealing work can purchase “Short Tales of the Old Wild West” at bookstores everywhere, or online at the Apple iTunes store, Amazon, Google Play, Kobo or Barnes and Noble.